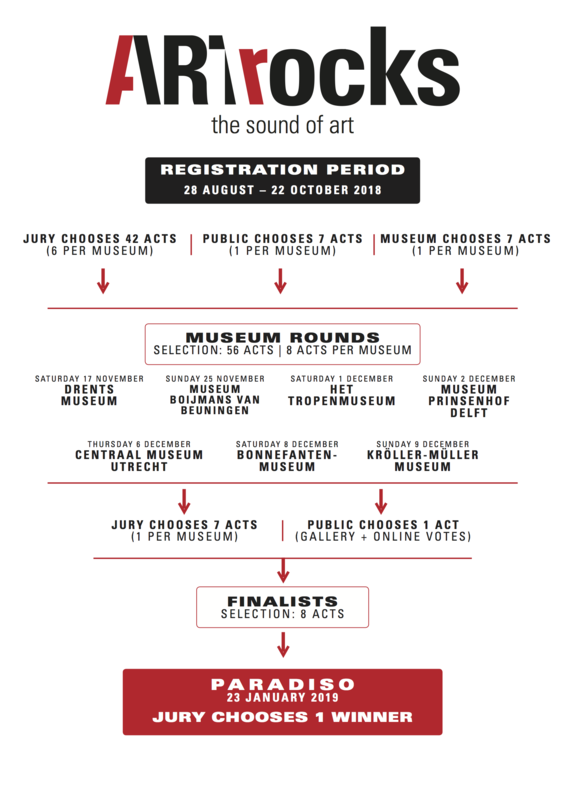 What is the Art Rocks music competition? Art Rocks is the largest music competition in the Netherlands that fuses music and the visual arts. Art Rocks challenges musicians to write a song inspired by one of more than fifty artworks in the collections of the following leading Dutch museums: Museum Boijmans Van Beuningen in Rotterdam, the Kröller-Müller Museum in Otterlo, the Bonnefantenmuseum in Maastricht, the Drents Museum in Assen; the Tropenmuseum in Amsterdam, Museum Prinsenhof in Delft and the Centraal Museum in Utrecht. The final will take place in Paradiso in Amsterdam. Select one of the 56 artworks and register via this page. Registration starts on 28 August 2018 and ends on 26 October 2018. Anyone aged fifteen or older can enter Art Rocks 2018. The competition is open to professional musicians and complete beginners and any size of act, from solo performers to twelve-piece orchestras. Just bear in mind that the technical facilities for performing in a museum may be limited. Entries are accepted in any musical style.